Describe the benefits of using Western Red Cedar in terms of healthy, green building and life-cycle analysis. List the main performance attributes of Western red cedar and how they differ from other forestry products and comparable construction materials. Explain how Western Red Cedar performs in terms of energy efficiency, dimensional stability, durability and resilience, as well as health and wellness considerations such as biophilia. Discuss the kinds of Western Red Cedar applications including the use of knotty grades and charred finishes, with attention to their environmental benefits. 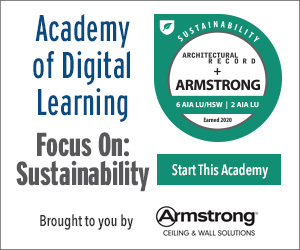 Today’s overarching design trends have made sustainability a core competency for architects and project teams. No longer content to talk about green building as a special knowledge area, it is viewed more as a core aspect of good design—the “sustainability competence” that Gaia Architects’ Sandy Halliday wrote about a few years ago in her book, Sustainable Construction. On top of that, sustainability has expanded in its definition and application to include considerations about human health and physiological function as well as psychological wellbeing and social and cultural underpinnings. Indeed, today’s green thinking pervades practically every aspect of human experience and certainly every phase of building planning and operations. For this reason and others, certain areas of building material selection have become highly complex. Issues to consider in the project planning and schematic design phases include: How durable and resilient is the product? Which, if any, health issues are raised in its use, including material toxicity? What goes into the product’s extraction and manufacture? Are there tradeoffs between local supplies and regional transportation or imported goods? Is the product innately appealing, and are there other similar humanistic considerations? How is it cleaned? What options are available for disposal at end of life? The list goes on. Answering these questions has led architects to the use of certain materials that are either highly novel—electrochromic glazing, for example—or long-established and conventional, such as masonry and wood. In this latter category, the more traditional products are often deployed as part of innovative assemblies that enhance their value and positive attributes. Architects working with Western Red Cedar, for example, have recently begun exploring new aesthetic territory by combining various patterns and sizes as well as by employing knotty grades, which can project a rustic or graphic appearance, as opposed to the cleaner look of clear grades. Other novel directions include the use of a charred finish, which renders a sleek, slate-gray hue or a deeper char with patterns resembling alligator skin. 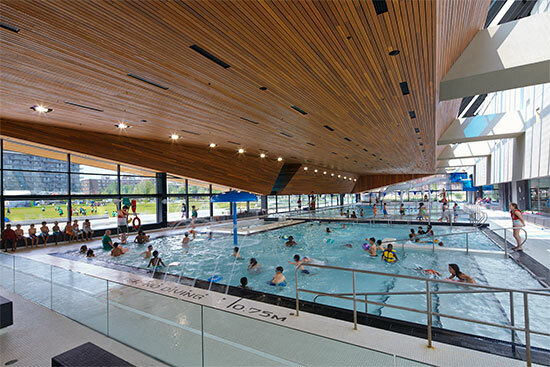 The award-winning, sustainably designed Regent Park Aquatic Centre in Toronto designed by MacLennan Jaunkalns Miller Architects employs Western Red Cedar for its large and expressive soffit. In spite of their associations with residential vernacular, Western Red Cedar and other natural materials are increasingly specified for commercial and institutional facilities. Examples include retail and hospitality buildings as well as new educational structures around the country. Toronto’s award-winning, super-modern natatorium by MacLennan Jaunkalns Miller Architects presents an undulating zinc facade connecting to a monumental soffit of Western Red Cedar, applied as a tongue-and-groove system outside and as interior slats with an acoustical underlay. Other approaches have included the decorative weave applications by Urban Arts Architecture for the expressive and sprawling T’it’q’et Community Hall + Health Centre, or the mast-supported overhang protecting a branch of the Salmon Arm Savings & Credit Union by RATIO Architecture Interior Design + Planning Inc., both in British Columbia. More projects today use Western Red Cedar on both exterior and interior surfaces, such as the Brady Lane Residence in Texas by Webber + Studio Architects, unifying the composition and exploiting the material’s green attributes. Recent LCA studies have helped compare multiple material types. Among the most compelling is one analysis by the research laboratory FPInnovations-Forintek demonstrating the benefits of the wood species Thuja plicata (commonly called Western Red Cedar) against non-wood building materials used for residential siding and decking. The studied materials ranged from relatively novel products such as wood-plastic composite (WPC) to fiber-cement materials to extruded vinyl. In measurable areas such as resource and water use, energy requirements, transportation implications, and waste creation, the natural wood found mainly in the Pacific Northwest showed substantial advantages for sustainable design. For this reason, says John Wagner, a sustainability consultant and cofounder of the Certified Green Dealer Program, architects and end-users “who previously favored what they considered to be ‘maintenance-free’ materials need to consider this natural alternative, which will help lessen their environmental footprint.” Wagner acknowledges that the LCA showed Western Red Cedar as the least environmentally burdensome and the lowest consumer of nonrenewable resources, such as fossil fuel. Lauded for years in certain circles for the material’s durability, beauty and value, Western Red Cedar earned a comparative and scientifically reasoned grounding for its environmental benefits. A look at its history, cultivation, building uses, and human factors adds even more weight to what Wagner and others already see as a compelling answer to today’s toughest questions about the core design competency of sustainable design. 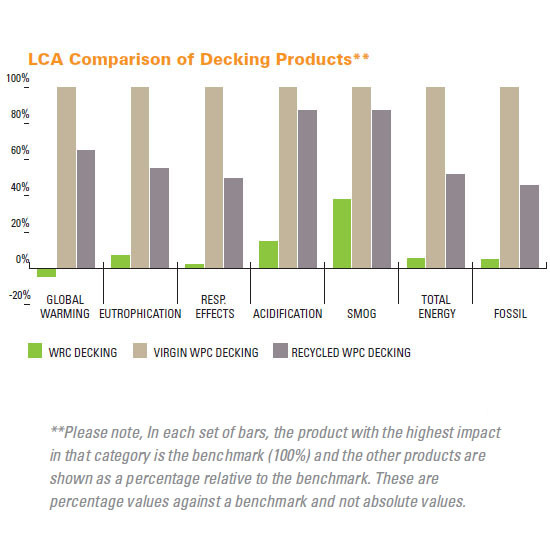 A recent life-cycle assessment or LCA study comparing Western Red Cedar (WRC) to Wood Plastic Composite (WPC) decking products indicates the low total energy requirements for producing WRC, which helps explain its low impacts for smog and global warming.